Corporate tax reform, cybersecurity risks and financial regulations were timely discussion topics at "Post Election Challenges and Opportunities," the 2017 Business ForUM hosted by the School’s Department of Accounting. Sundaresh Ramnath, associate professor and chair, Department of Accounting, hosted the conference, which was dedicated to the late professor Maggie Alvarez Quintero, who organized the first two forums. Ramnath also presented the Faculty Member of the Year Award to retiring accounting professor Oscar Holzmann, who taught at the school for 37 years. Sharon C. Brown (BBA ’66), one of the state’s first female accountants, the first female president of the Florida Institute of CPAs (FICPA) and former associate dean of the School of Business was honored as Alumna of the Year. “I have thoroughly enjoyed my career in public accounting, and I encourage you to provide scholarships to support the future of this exciting profession,” Brown said. We must never stop learning or challenging ourselves. 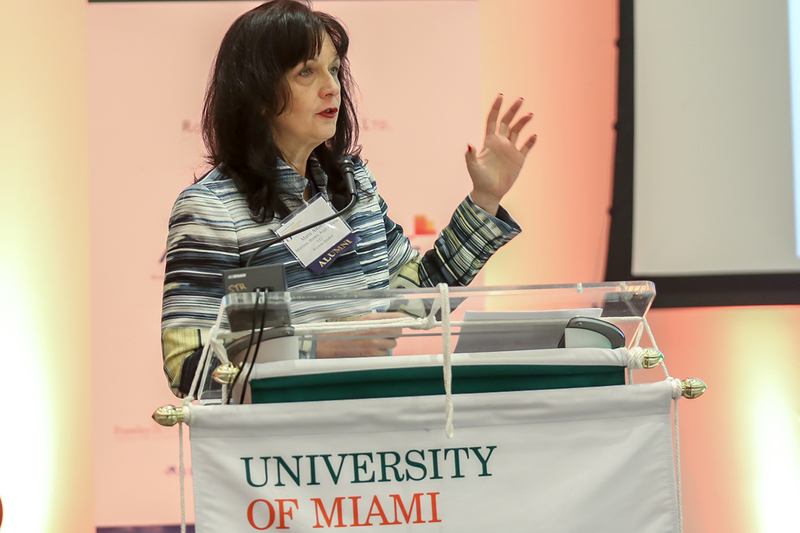 Keynote speaker Marta Alfonso (BBA ’83, JD ’98), litigation and valuation principal, MBAF Certified Public Accountants and Advisors, challenged attendees to turn the confusion and ambiguity in today’s economy into an opportunity to grow. “We must never stop learning or challenging ourselves,” she said. ‘That means accelerating your intellect with information – not noise– so you make good decisions for your career, your clients and your organization.”Alfonso said accountants need to be change agents, using tools like drones to conduct inventories or artificial intelligence (AI) to do an initial analysis for an audit. “We must continue to take care of the compliance, financial and security issues that make us valuable business advisors, while embracing innovation,” she said. Understanding both the risks and opportunities of technology will also help accountants secure their clients’ personal and business information, Alfonso added. She also challenged attendees to protect their clients against corruption and stay true to the principles of good business and ethical conduct. Robert Villanueva, executive vice president, Q6 Cyber, and a retired member of the U.S. Secret Service’ Cyber Intelligence Section, gave attendees an in-depth look at “Eurasian Cybercrime and Cyber Threat Intelligence" that included a live tour of the “dark web,” where criminals can buy or sell hacking tools, stolen credit card numbers and other financial information. “There are hundreds of highly developed and efficient marketplaces, offering financial crime as a service,” he said. “They are mostly situated in Eastern Europe, where they target companies and individuals in the U.S., Europe, Asia and Latin America.” One store, for instance, has 100,000 U.S. credit cards for sale, and will issue a refund if a card is no longer valid. South Florida is an attractive target for several reasons, Villanueva said. There are many wealthy residents here, along with international visitors who may not take basic security precautions. Miami is also an attractive destination for free-spending cyber criminals, and is showcased in online recruiting videos posted by criminal organizations. For example, Aleksandr Kostyukov, known as the “Miami-Russian Rapper,” stole more than $8 million from U.S. citizens and financial institutions before he was arrested in 2015. Aleksei Satalov, a hacker from Estonia, was arrested in 2013 at a party on South Beach. Villanueva said he had control of 100,000 computers that were used to launch cyber attacks and blackmail companies. Along with hacking into organization’s networks to steal data or lock up information for ransom, cyber threats include point-of-sale (POS) malware that steals payment card data, and the theft of funds from law firms’ escrow accounts, he said. “We also see compromised merchant accounts and fake accounts used to launder money. Criminals are also targeting trading firms and retirement accounts,” he said. Hiram de Amo, cyber security consultant, Berkeley Research Group, emphasized the importance of backing up data, and unplugging computers at night so they are no longer visible to hackers. “Think before you click,” said Villanueva, who said phishing schemes are designed to get users to open email messages that contain hidden malware. With today’s shortage of cyber security professionals, the panelists agreed on the importance of building a pipeline of young talent. “Internships can expose college students to different cyber security career opportunities," Liddell said. Mark Margulies (BBA '89, MSTX ’90), chair of the school’s Accounting Advisory Board and Florida tax practice leader, Grant Thornton LLP, kicked off a morning panel on “Tax Policy and Reform,” noting that it’s been 30 years since the last tax reform act. Daniel Rahill, managing director, Midwest Tax Practice Leader, Alvarez & Marsal, moderated the discussion with Mel Schwarz, partner and director, tax legislative affairs, Grant Thornton, in Washington, and Mark Mesler, principal, tax controversy and risk management, Ernst & Young in Atlanta. Mesler said the U.S. corporate tax rate of 39.1 percent is one of highest in the world. In addition, the U.S. system taxes income made throughout the world, making U.S. multinationals less competitive in the global market. “Lowering that rate has bipartisan agreement, and this is at the top of the list as to what might be enacted by Congress,” said Schwarz. On the other hand, border adjustment tax on imports, pass-through rates for partnerships and “S” corporations, and eliminating most itemized deductions are among issues now being debated in Washington. William Marquardt, director of global investigations, Berkeley Research Group, also emphasized the need for compliance, as he expects no slowdown in enforcement actions under the Foreign Corrupt Practices Act (FCPA). Training needs to go beyond “check-the-box” programs, he added. Joe Genovese, adjunct accounting professor, moderated the last panel, “Accounting and Auditing Updates,” which included professionals familiar with the infrastructure, healthcare and financial sectors. George Pita, chief financial officer, Mastec, said the $6 billion Miami engineering company and its infrastructure clients would benefit from corporate tax reform and more consistency in regulations. He added that Mastec is now studying 16 new accounting standards across its service lines on issues such as stock-based compensation. Richard Sacher, partner, audit services, Grant Thornton, said new standards regarding leasing and recognition of revenue will affect the balance sheet for many healthcare organizations.